Routine clients are billed twice a month for all services rendered. Payment is due at the end of each billing cycle. We accept cash, checks and payment through PayPal. Checks should be made out to "Pawfessional Pet Services" or Mary Hannigan ("owner"). Clients can leave payment for pick-up by the walker or prepay by PayPal. Pawfessional Pet Services has the right to terminate all services in the event payment becomes infrequent, untimely or if the balance becomes much in arrears. Pawfessional Pet Services understands and appreciates the ever changing schedule of an active professional family. However, in order to maintain proper scheduling and communication, please ensure all cancellations are made at least 4 hours in advance of your pet's scheduled visit. You will be charged for services if you fail to cancel within the allotted time. Not to worry, Pawfessional Pet Services provides services all year round! Please note that Holiday visits incur a minor surcharge. View our "news page" for more information regarding Pet Holidays. Please be sure there is an extra set of keys to your home in the event something happens and our pet sitters can not access your home. Pawfessional Pet Services will take every precaution necessary to ensure your pet is safe, healthy, and has the time of his/her life. We promise to take every safeguard possible to ensure that all animals in our care are treated equally and to the best of our abilities. Please be advised that incidents, although rare, can happen whenever animals get together in a "different" setting. Pawfessional Pet Services is not liable for injuries or illnesses that any animal may incur while in our care. 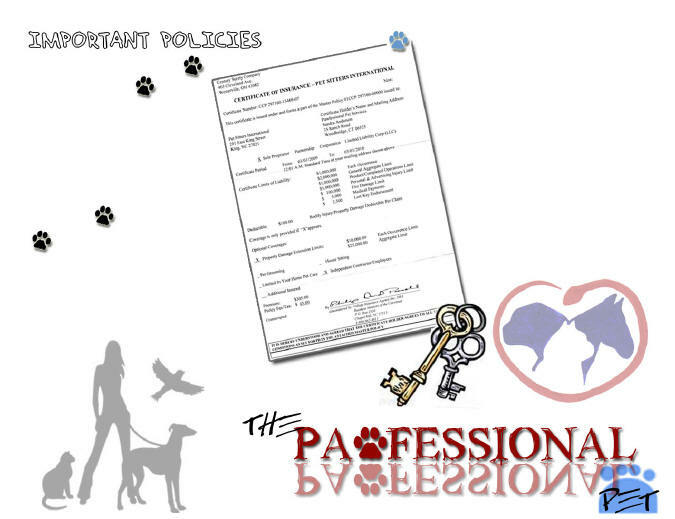 Pawfessional Pet Services wants you to better understand what this means, Insured and Bonded. We take care of your pets and your belongings while you are away. During your vacation you can feel confident leaving everything up to us.